It doesn’t matter that Fantastic Four is the worst movie of all time, because there’s a new superhero in town, and her name is Morgan Watson. 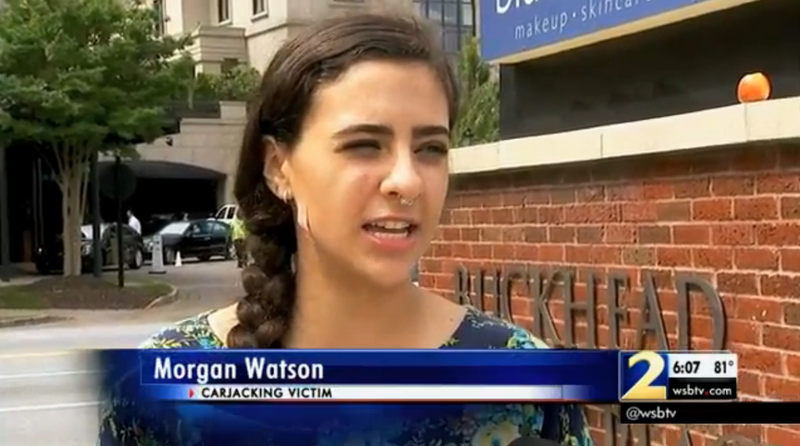 She fended off a carjacker with a boxcutter near Atlanta and gave one of the best interviews about it to WSB-TV Atlanta. Watson was getting back in her Range Rover at the grocery store when her attacker held her door open and pointed a box cutter at her. Watson fought back: “I punched him a few times, and then I started biting his arm, because I didn’t have a weapon on me. Watson told Gehlbach the suspect was a portly man, but wasn’t very strong. Watson escaped, but the suspect took off with her car. Fortunately for investigators, he was lost, or confused, or maybe just stupid, because he turned around and drove right past the Whole Foods parking lot where he originally stole the car. Officers followed the Range Rover from there. The suspect was apprehended after police performed a PIT maneuver on the Rover, causing it to flip into a ditch.